The kitchen is the heart of every home. It's not only a place for cooking and eating; it's a space for entertaining guests, gathering family and daily living. When planning for your kitchen renovation, or a kitchen in your new custom home, integrating organizational systems into the design is crucial. So where do you start? Make a list of what you will need to store. Where will you put everything in your new kitchen? We've got 5 ways to design an organized and clutter-free kitchen. Kitchen cabinets are, of course, made for storage. 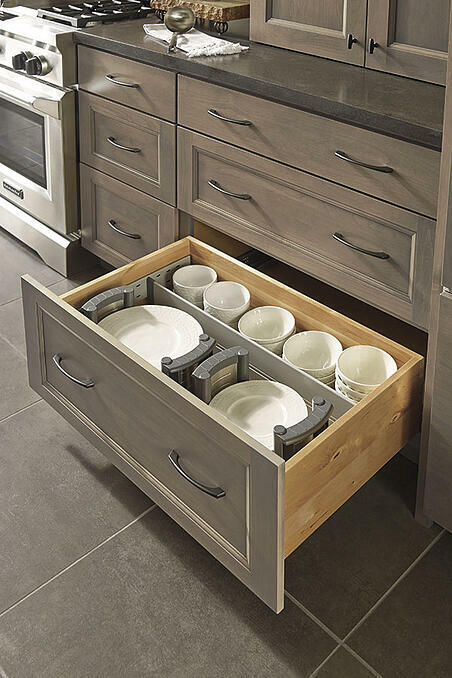 But, how do you use the space inside the cabinets efficiently to keep yourself highly organized? Most kitchens have base cabinets with doors. Pull-outs inside can make it easy to see what is way in the back - no more rooting around trying to find a lid or other small item. 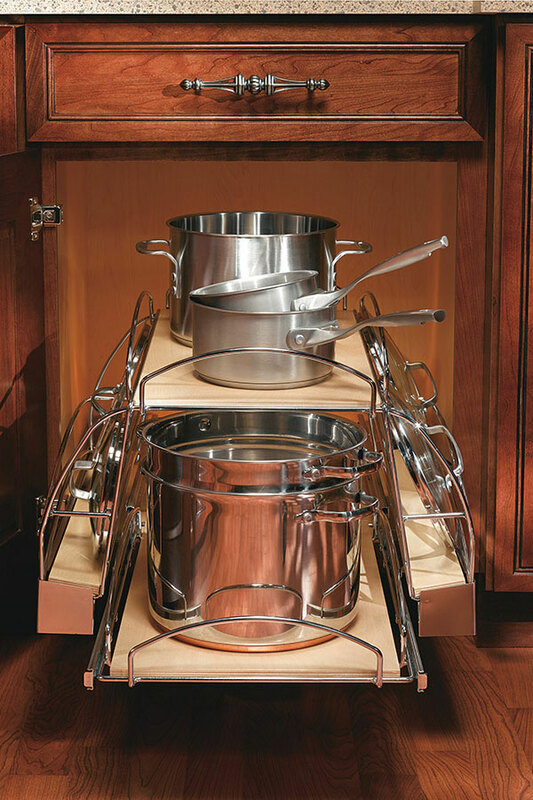 Dishes, pots, pans and other large items can be stacked inside deep drawers for maximum efficiency of space. Customized, adjustable dividers can keep everything in place and tidy. 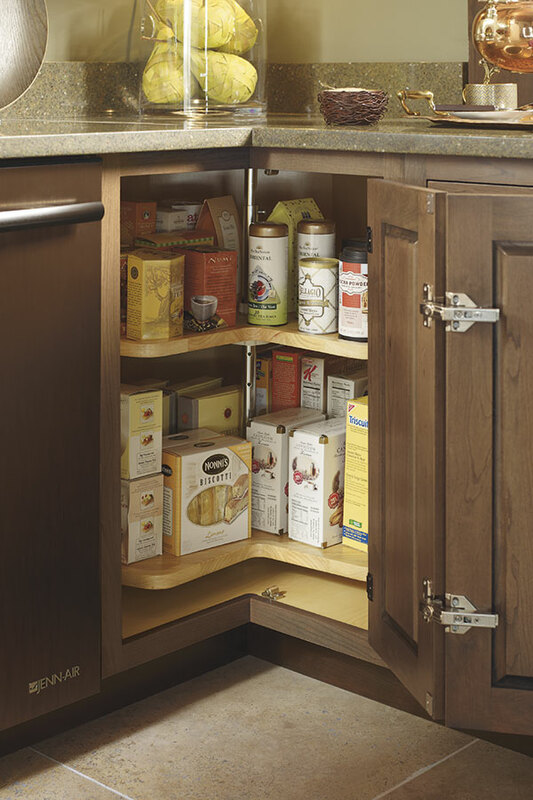 A corner cabinet can often be wasted space. You can't really reach to the back corner, so only the front of the cabinet is utilized for storage. Installing a Lazy Susan will solve that problem. The rotating shelves make the entire cabinet functional and will keep small appliances or canned food items neatly organized. All of those small bottles can become a cluttered mess when they are on your kitchen counter or stuffed into a large cabinet. 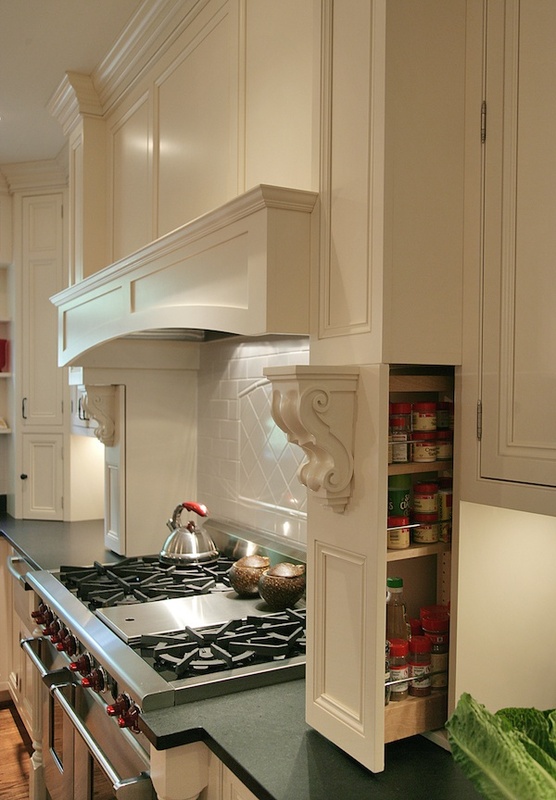 Plan for a special cabinet pull-out right next to your cook top in your kitchen design. All of your spices will be organized and right at your fingertips. 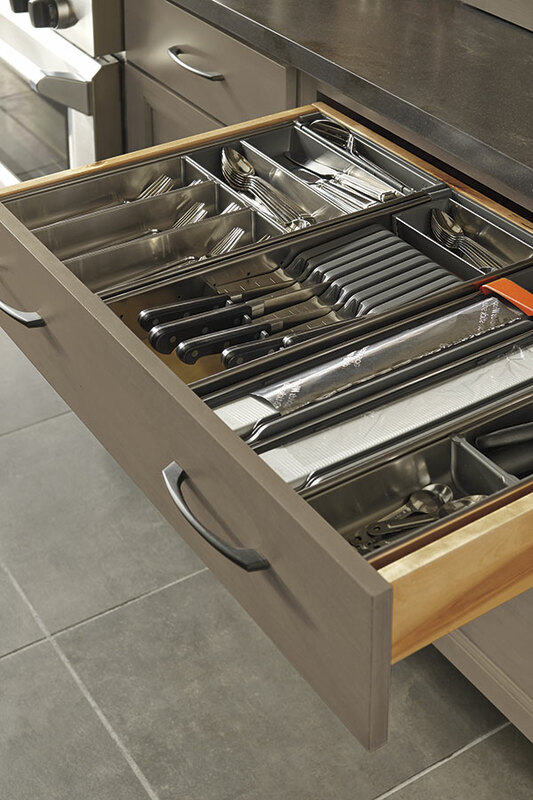 Ask for dividers within your drawers to keep your flatware and other utensils neatly in place. 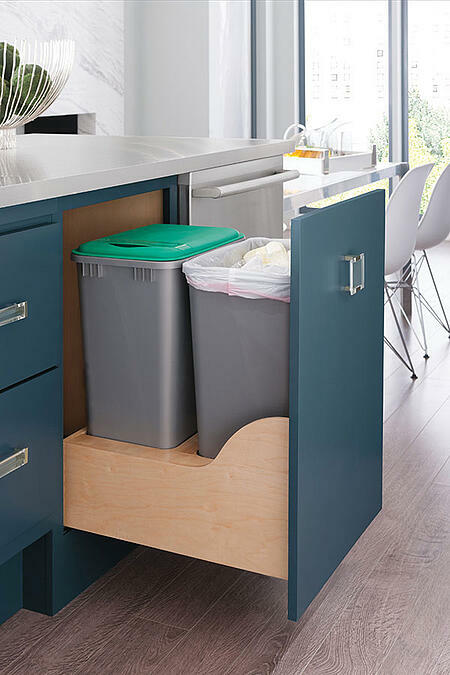 A double-can trash and recycling center in a base cabinet that is right next to your sink is ideal. It will make separating your trash and recyclables simple and convenient. 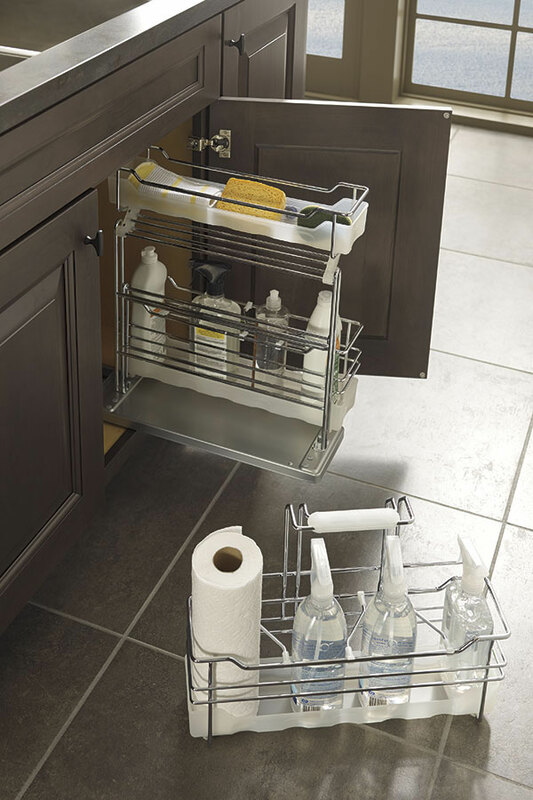 A built-in, sliding caddy under your sink will keep your cleaning supplies organized and handy. Some are also portable, which would allow you to grab the entire caddy and take your cleaning supplies wherever you need them to keep your new kitchen spotless! If space allows, a pantry in your kitchen is the ideal place to store all of your food items, and sometimes, extra cookware. 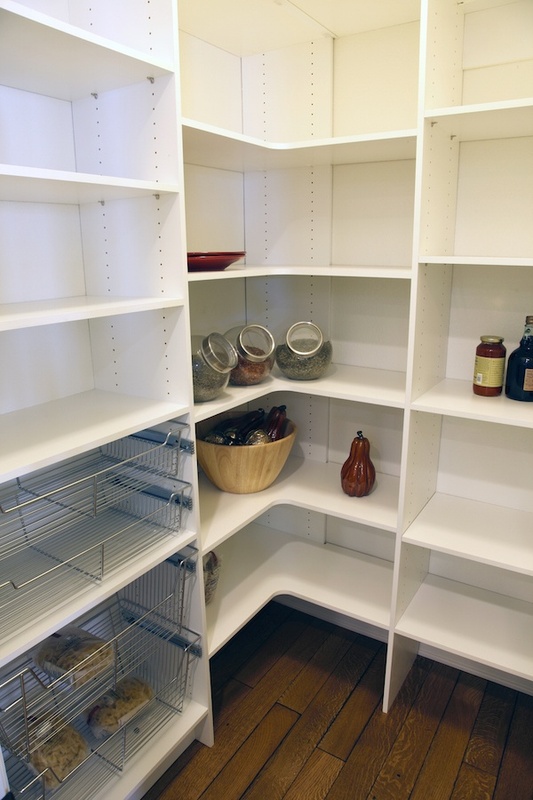 Customized shelving and bins can be installed to keep your pantry organized. Installing electrical plugs inside your pantry will enable you to plug in a rechargeable vacuum or your kids' computers at night. A customized, built-in storage unit can be designed to look like a beautiful piece of furniture, and can offer additional storage. A lovely hutch or bookcase can be a striking focal point in your new kitchen and can be a place to display special items. Since the kitchen is the hub of all activity in your home, carving out a centralized place to keep your family's daily life organized is important. Having a small desk, compartmentalized drawers for filing paperwork, a spot for a calendar and note board, and a charging station for your computer and phones will keep your kitchen, and your life, orderly and neat. These days, many people use the Internet to find recipes and cooking tips. De-clutter by getting rid of piles of cookbooks that take up so much space. Instead, ask your homebuilder to install a tablet holder under a kitchen cabinet. Make sure that there is the proper electrical wiring inside the cabinet if you wish to have a charging station too. 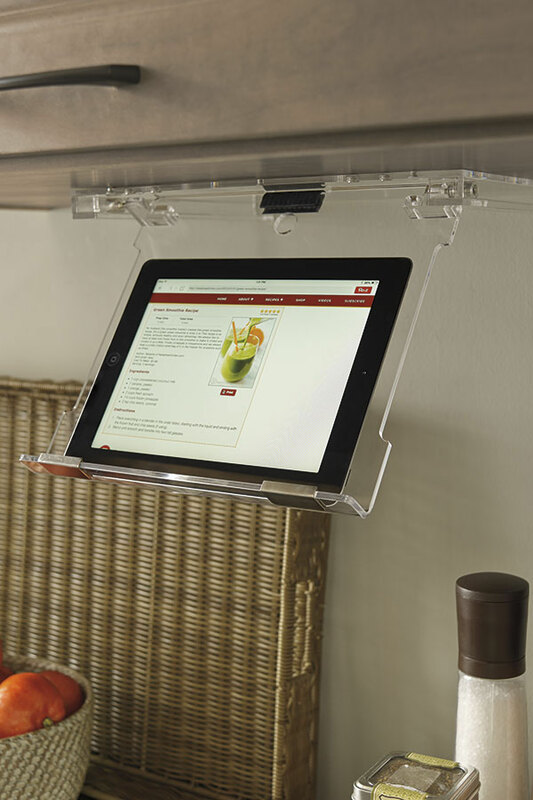 The tablet holder can be tucked under the cabinet and out of the way when it's not needed. Also, some refrigerators now have built-in electronic grocery lists that will help keep you on top of everything you need before heading out to the store. 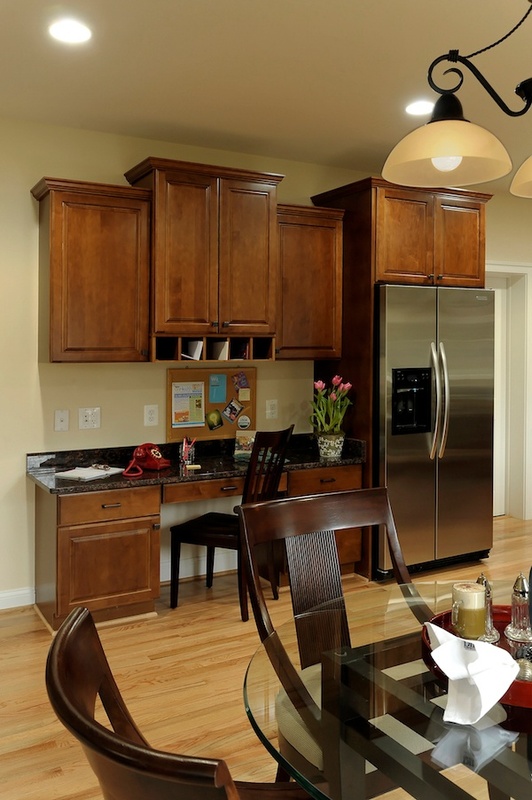 A professional homebuilder or kitchen designer can work with you to create your ideal kitchen. Share your goals and objectives from the start. 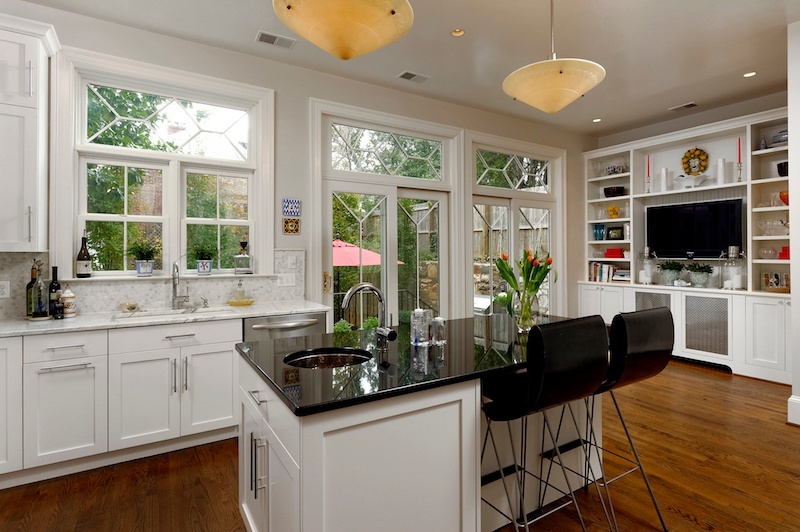 Be clear that you want organizational systems as part of your kitchen design. Ask about the best and most creative ways to organize your space so that it is functional and clutter-free. Collaboration with experts is the surest path to loving your new kitchen!